When Choirs Sing, Many Hearts Beat As One : Shots - Health News When members of a choir sing, their heart rates quickly become synchronized, beating in the same rhythm. Researchers think this may be why singing together is a key part of religious rituals around the world, and such a joy for the singers. We open our hymnals to Hymn 379, and we begin to sing. "God is Love, let heav'n adore him / God is Love, let earth rejoice ..."
Lifting voices together in praise can be a transcendent experience, unifying a congregation in a way that is somehow both fervent and soothing. But is there actually a physical basis for those feelings? To find this out, researchers of the Sahlgrenska Academy at the University of Gothenburg in Sweden studied the heart rates of high school choir members as they joined their voices. Their findings, published this week in Frontiers in Neuroscience, confirm that choir music has calming effects on the heart — especially when sung in unison. A Swedish researcher explains how heart rates become synchronized when people sing together. 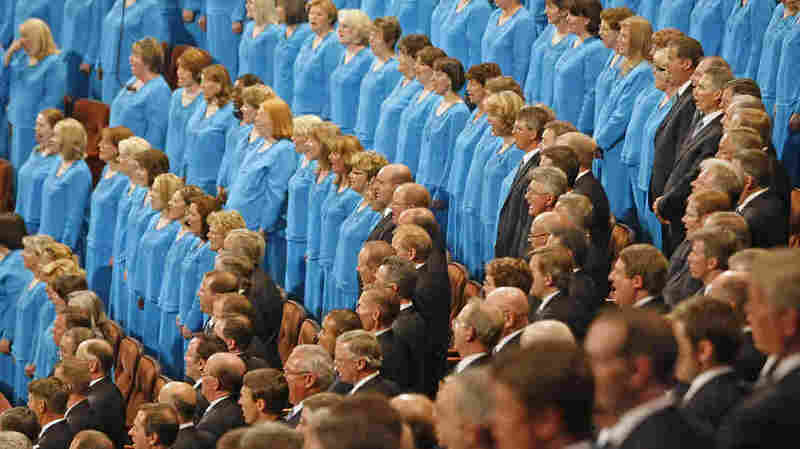 Using pulse monitors attached to the singers' ears, the researchers measured the changes in the choir members' heart rates as they navigated the intricate harmonies of a Swedish hymn. When the choir began to sing, their heart rates slowed down. "When you sing the phrases, it is a form of guided breathing," says musicologist Bjorn Vickhoff of the Sahlgrenska Academy who led the project. "You exhale on the phrases and breathe in between the phrases. When you exhale, the heart slows down." But what really struck him was that it took almost no time at all for the singers' heart rates to become synchronized. The readout from the pulse monitors starts as a jumble of jagged lines, but quickly becomes a series of uniform peaks. The heart rates fall into a shared rhythm guided by the song's tempo. "The members of the choir are synchronizing externally with the melody and the rhythm, and now we see it has an internal counterpart," Vickhoff says. This is just one little study, and these findings might not apply to other singers. But all religions and cultures have some ritual of song, and it's tempting to ask what this could mean about shared musical experience and communal spirituality. "It's a beautiful way to feel. You are not alone but with others who feel the same way," Vickhoff says. He plans to continue exploring the physical and neurological responses of our body to music on a long-term project he calls Body Score. As an instructor, he wonders how this knowledge might be used to create more cohesive group dynamic in a classroom setting or in the workplace. "When I was young, every day started with a teacher sitting down at an old organ to sing a hymn," Vickhoff says. "Wasn't that a good idea — to get the class to think, 'We are one, and we are going to work together today.' "
Perhaps hymns aren't for everyone, but we want to know, what songs soothe your heart? For a bit of inspiration, we've included a clip of the Mormon Tabernacle Choir, whose members know a lot about singing together.